While the Nintendo Entertainment System may have been the console that bounced the video game industry back when it crashed in 1983, a console is nothing without its "killer app"; a game that people want so badly that they buy the system specifically to play it. Yes, the NES is a great system, but it would be nothing without Super Mario Bros., the game that saved video games. The Minds Behind Super Mario Bros.
Super Mario Bros. may not be the first platformer, but it’s by far the most successful and the archetype that all games in the genre that would follow. The brainchild of legendary video game designer Shigeru Miyamoto, the concept evolved from his 1981 creation Donkey Kong, a single screen platformer arcade game and Mario’s debut (then called Jump Man). Miyamoto continued perfecting his single screen platformer designs with arcade classics ​Donkey Kong Junior (1982) and Popeye (1982) until finally moving Mario into his own game, Mario Bros., and adding a brother, Luigi, who served as the second player character. After Mario, Miyamoto started work on his very first console title for the Nintendo Famicom (the Japanese version of the Nintendo Entertainment System), with a ​Pac-Man style maze game, Devil World (1984). On Devil World Miyamoto supervised a newbie, Takashi Tezuka, who would build out Miyamoto’s designs and concepts as well as design sections of the game himself. While Devil World was a maze game and not a platformer, it did lead to some Mario influences in monster and minion designs. It also established the collaborative game designs of Miyamoto and Tezuka who continue their work together today. The next game for the team was the historic Super Mario Bros., with Miyamoto creating the overall primary concepts and designs, and Tezuka crafting them into a reality. The title brought together elements from all of Miyamoto’s previous single screen platformers, only instead of all the action happening on a single screen the game scrolled, opening up an entire world for the Brothers to traverse. Unlike the original Mario Bros. the two siblings cannot play simultaneously. Luigi, a green clone of his brother remains the second player character, but each level is played solo, with the brothers (and players) switching off between levels. The game itself consists of eight worlds, each broken into a series of levels, bonus rooms, and boss levels. Buzzy Beetle – A helmet-wearing ball of a critter. The Hammer Brothers – Twin Brothers with a turtle shell that looks like Jr. Bowsers. Lakitu – A cloud-riding turtle who tosses his spiky pet at you. Piranha Plants – Man (or Mario) eating plants that pop up from pipes throughout the kingdom. 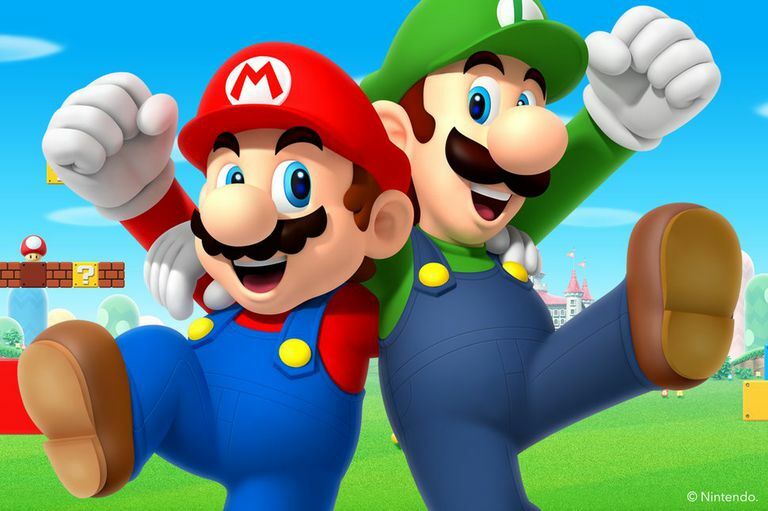 To do battle against their enemies, Mario and Luigi depend on power-ups that he snags by knocking or triggering the boxes and bricks that contain them. Magic Mushroom – An Alice in Wonderland reference that has Mario grow twice his size. Starman – Gives the brothers limited immunity. Coins – Gathered to gain extra points and bonus lives. Each level moves linearly from right-to-left and does not allow the player to backtrack. The platforms consist of landmasses, blocks, bricks, scaffolding, pipes and pipe works, and various items that theme the world such as pyramids, clouds, and the bottom of the sea (in the underwater levels). Within each level are several hidden bonus areas, some located beneath the surface accessed via pipes (after all, they are still plumbers) and in the clouds accessed by leaping on Jumping Boards. The game received a huge reception and became the “must play” title of the console's generation. Nintendo began combining Super Mario Bros. on a cartridge with Duck Hunt and bundling it with the NES to help promote sales. People would buy the NES just to play Super Mario Bros. Between sales as a standalone game and when bundled with the system, Super Mario Bros. became the all-time best selling video game for nearly 24 years with a total of 40,241 million NES versions sold worldwide. Wii Sports finally broke this record in 2009, having sold 60.67 million copies. Since the launch of Super Mario Bros. Mario has become an iconic video game character, the only other to rank up there with Pac-Man as the most recognized worldwide. He also is Nintendo’s spokescharacter, appearing in an enormous number of sequels, and spin-offs, always as the must-have game for each generation of Nintendo consoles.